While the month-long informal building event known as Ma.Ktober that happens every October may be over, The Maschinen Krieger movement that is the inspiration never really stops. For those not familiar with the phenomenon, it started in the early 1980’s as a sci-fi series in a Japanese hobby magazine, and the creators, using off the shelf model kits for airplanes, tanks, and other vehicles, created surreal combinations of armored hard suits and vehicles with strong alien and insect-like aspects. Two-legged walkers like this creation by Marco Marozzi are a popular subject as well. The tall spindly legs have a very industrial feel, complete with pistons to drive each footstep deep into the rubble covered ground. Multiple sensors and ominous canisters cover the head and body of this drone as it seeks out its prey, and that belly mounted contraption looks like it could ruin your day. 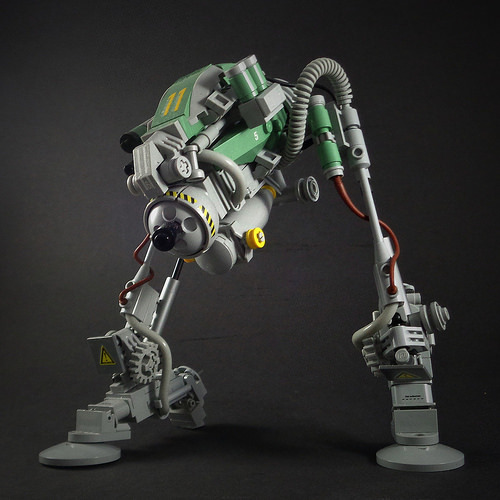 Every October, LEGO builders assemble their bricks for Ma.Ktober, a build challenge inspired by the 1980’s Japanese plastic models Maschinen Krieger. Chris Perron‘s contribution this year combines an old-style Dewback body with a bubble canopy and some rather ingenious parts usage for greebly bits on its legs, including crutches as struts. The sponson-mounted cannons are also an excellent touch. I love when a builder takes an existing LEGO set and creates an alternative model. 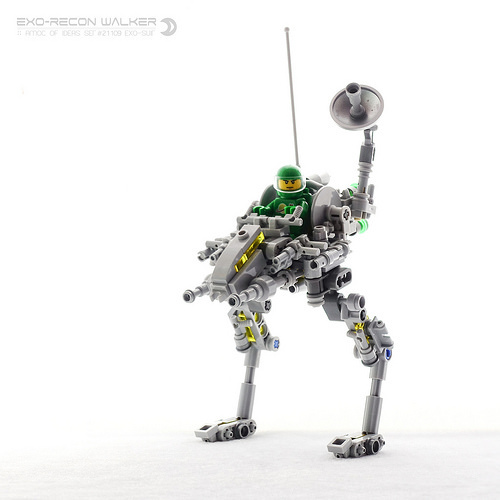 Dvd has gone one step further with his Exo-Recon Walker, using the parts from Peter Reid’s successful LEGO Ideas set #21109 Exo-Suit to recreate another of Peter’s designs, the Recon Walker. 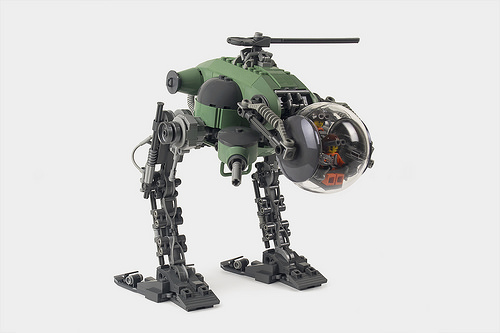 Not only that, but Dvd has even been so kind as to include an LDD File so if you have the Ideas set, you can build your own Exo-Recon Walker! When The Empire Strikes Back first premiered in 1980, Star Wars fans of every age had their collective minds blown when the AT-AT first marched across the snowy battlefield of Hoth. Since that day, the AT-AT has surely become one of the most referenced vehicles in Star Wars, with the possible exception of the Millenium Falcon. 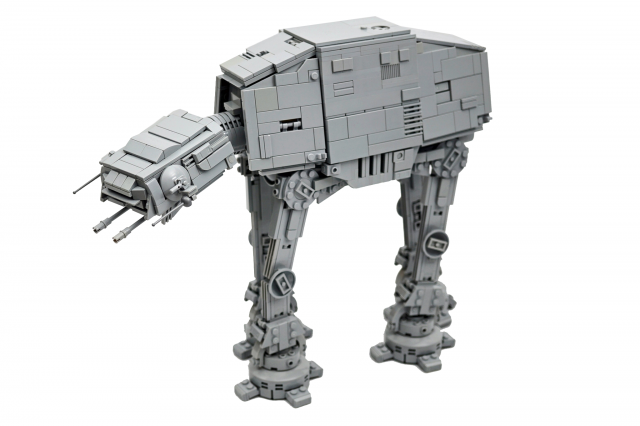 Tim Goddard has put together a LEGO creation intended to show the AT-AT in relation to the new AT-M6 featured in Star Wars: The Last Jedi, and in doing so, has achieved a highly detailed, accurate depiction that stands out very nicely. I especially like the use of tiles of many sizes to achieve a paneled look, including a few headlight bricks to pop some tiles out. 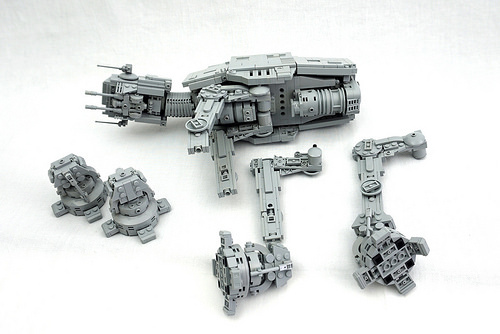 Looking at the underside and leg assembly shows a particular attention to detail and captures the complicated mechanical nature of this unique vehicle. 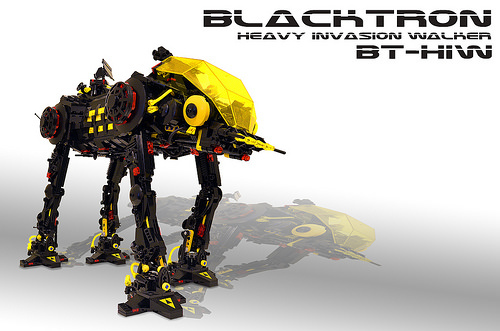 The BT-HIW, Blacktron Heavy Invasion Walker, is a glorious black and transparent-yellow sight to behold. Built by Rat Dude, this impressive walker manages to balance not only itself, but that classic space feel many builders strive for.